Nano-Stick Pool and Spa Clarifier and Nano Cover Protectant. ● Nano-Sticks for clarifying water and removing organics. ● Nano-Sticks help reduce chemical usage. ● Nano-Sticks help improve water quality. ● Nano-Spray for preserving spa thermal covers. Scroll down to browse through information about Nano-Technology products for clarifying pool and spa water and a Nano-Technology Spa Thermal Cover Protectant Spray, for controlling mold problems and extending the life of the spa cover, This is 21st Century Technology. The Website Store Directory contains an alphabetized listing of all products for sale. We don't just sell products. We help you make a better-informed choice, by providing all the information, you might require. Need ordering help? Scroll down the page, for the Order Desk Telephone Help Number. All items ordered will end up in the same shopping cart, no matter which page of this website, the items are located. All Major Credit Cards and PayPal are accepted. Order one today. This revolutionary, patented product uses Nano-Titanium and provides innovative filtration and purification solutions for Pools and Spas. With the use of the patented porous Nano-Titanium Technology, your water will be so clean and clear, you will see and feel the difference. Why settle for 20th century results, when you can have all the benefits of a 21st Century revolution in Pool and Spa water clarity and purity? Light activates the Nano-Titanium and organic contamination is destroyed, while Pool and Spa water clarity and quality improves. Isn't Sparkling, Crystal-Clear water what you really want??? Nano-Technology Products for Pools and Spas. The goal is always the same: crystal-clear pool or spa water. Few pool or spa water problems are as frustrating as cloudy, hazy or dull water. Everyone wants the water to sparkle, just like in the movies. Unfortunately, organic byproducts, body oils, organic contamination and mold, mildew and spores don't always make that goal simple to achieve. Pool and Spa filters just cannot remove everything. The Nano-Sticks, use Nano-Titanium technology, within the ceramic media, to decompose organic matter. This is done without the use of chemicals or resulting in anything being added to the water. The technology only uses light and water to activate its remarkable benefits. It is a clearly better approach to solving this most common problem! ● Safe, Non-Chemical Water Clarifier, that adds no chemicals to the pool or spa water. ● Utilizes light to reduce organics. ● Leaves no chemical byproducts. ● Safe to use with all types of pool or spa surfaces. ● Contains no chemicals that can cause staining or discoloration. ● Has no effect on pH or water chemistry. ● Helps reduce chlorine or shock usage. ● Compatible with all types of sanitizers. ● Safe to use with salt chlorine generators. ● Why bother with weekly additions and having to add more chemicals? ● No installation: just hang it in the water, from a ladder or rail. ● Spa Nano-Stick: is 10" long and treats 500 gallons (1890 liters). ● Put technology to work for you and use fewer chemicals. ● Get better results using 21st Century Technology!!! In a covered spa, the unit recharges, when the spa is uncovered and it continues to work, after the cover is replaced. You will still have to use the customary pool and spa chemicals, for sanitizing and maintaining proper water chemistry. However, because the Nano-Sticks decompose organic matter, the sanitizer is more readily available to control algae and bacteria. Better control of microorganisms means more effective sanitation. The end result is that sanitizer usage will decrease and water quality will improve. And isn't that what you really want? Imagine a product that removes even ultra-fine particles and improves sanitizer effectiveness, without the addition of more chemicals and lasts 4-6 months. Nano-Sticks are the sensible, effective and clearly better way to improve water clarity, while adding fewer chemicals! Nano-Technology . 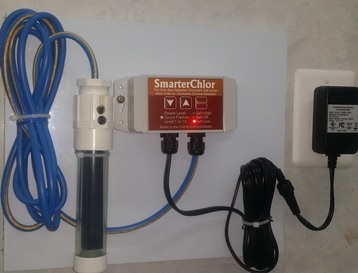 . . the 21st Century path to optimum water clarity!!! Scroll down to view Nano-Technology products and to place an order.